A unique collaboration between JORVIK Viking Centre and York Gin is set to have tastebuds tingling this month with the launch of Jorvik Botanicals, an exclusive new gift pack which provides the consumer with a delicious flavour of 10th century York. Both bilberries and nettles featured in the Viking diet, with both growing wild around the North. Bilberries thrive on high ground and moorland, with a limited harvesting season of just two months – August and September – when they have to be collected by hand, which makes them unattractive to 21st century mass-market growers, although in the early 20th century, huge quantities were imported from Germany, Holland and Scandinavia. They have a sharp, bitter taste, which complements the slightly peppery flavour of nettles when infused in gin. Jorvik Botanicals Gin will be launched in time for York’s new horticultural festival, Bloom!, which runs from 5 – 8 July 2018, and will be exclusively available to purchase from JORVIK Viking Centre’s gift shop. However, for a limited period, gin enthusiasts will be able to sample the unique flavour in York’s Evil Eye on Stonegate, which currently holds the Guinness World Record for having more varieties of gin for sale than any other bar on the planet. “Our gin is the first to be made in York, and indeed, our copper still is named ‘Ebor’ after the Roman name for the city, so although this is a new venture, we’re using traditional methods to create a classic dry gin that fits perfectly with both the historic city and modern tastes. We’re very excited to add this Norse twist to the gin – you get the sights, sounds and smells of Viking-age York in the JORVIK Viking Centre, and now you can enjoy a little taste of our Norse heritage in a refreshing glass of gin!” comments Emma Godivala from York Gin. The bottles of Jorvik Botanicals, with the bilberries and dried nettles in a canvas pouches, will be priced at £8.50 (5cl) and £35.00 (50cl), available from the JORVIK Viking Centre gift shop in Coppergate from 27 June 2018. 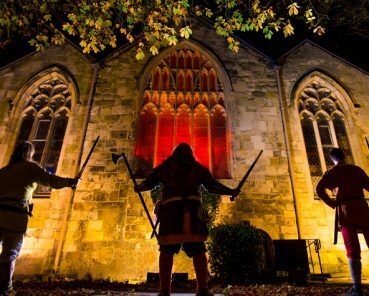 Today, three brothers – Halfdan Ragnarsson, Ubba Ragnarsson and Ivarr the Boneless – returned to the city to start the countdown to the next Viking invasion – the JORVIK Viking Festival 2018, which runs 12 – 18 February 2018. 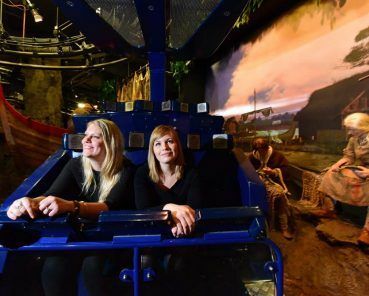 Five of York’s best loved attractions will adapt their experiences to create autism-friendly experiences on Friday 6th October to support the national ‘Autism Hour’ campaign. 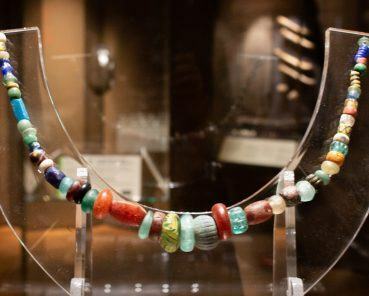 The importance of the mystical Viking role of ‘seer’ is being retold at JORVIK Viking Centre with the arrival of a series of artefacts discovered in the Isle of Man and Orkney to coincide with this year’s theme for JORVIK Viking Festival – the untold story of women in the Viking age.